Cary Grayson is sad to tell his fiancee that he will not be able to join her in New York this weekend. HIS HAS BEEN A SAD DAY I AM DUE IN WASHINGTON TOMORROW MORNING AND AM COUNTING ON GOING TO NEW YORK THURSDAY AFTERNOON TO REMAIN OVER SUNDAY BE SURE TO KEEP YOUR ENGAGEMENT FOR LUNCH FRIDAY EVERYTHING IS FINE WITH ME BEST WISHES FOR YOU. 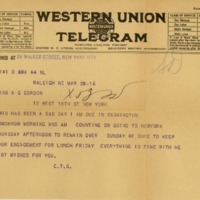 Grayson, Cary T. (Cary Travers), 1878-1938, “Cary T. Grayson to Alice Gertrude Gordon Grayson,” 1916 March 28, WWP20975, Cary T. Grayson Papers, Woodrow Wilson Presidential Library & Museum, Staunton, Virginia.